Mollie has been with the firm since its inception, is a founding partner, and is the company’s Directory of Human Resources. 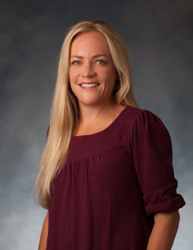 Prior to Beacon Pointe Advisors, Mollie worked as a finance and accounting consultant to various Registered Investment Advisors in Southern California. Mollie spent two years with Ocean Fund Advisors in Santa Monica as Director of Finance and Accounting. Mollie began her accounting career with KPMG in Orange County. At KPMG, she was a member of the Assurance and Advisory Services team and her clients included companies and institutions across a diverse range of industries, such as manufacturing, healthcare, technology, not-for-profit, and others. Mollie graduated Valedictorian from St. Mary’s College of California, where she received a BS in Accounting with a minor in Spanish. Mollie received her CPA (inactive), is a member of the California Society of CPAs as well as the American Institute of Certified Public Accountants, and has served on the Audit Committee of Pretend City Children’s Museum. Mollie is married, has four children, and lives in Newport Beach, California.